This post and bracket is made to hold two centered double-faced street signs. A 1 inch diameter steel rod goes thriough the center of the 2 in thick HDU or wood signs, and there are also side clamps welded to the rod attached to either side of the signs on the bottom to provide additional support. 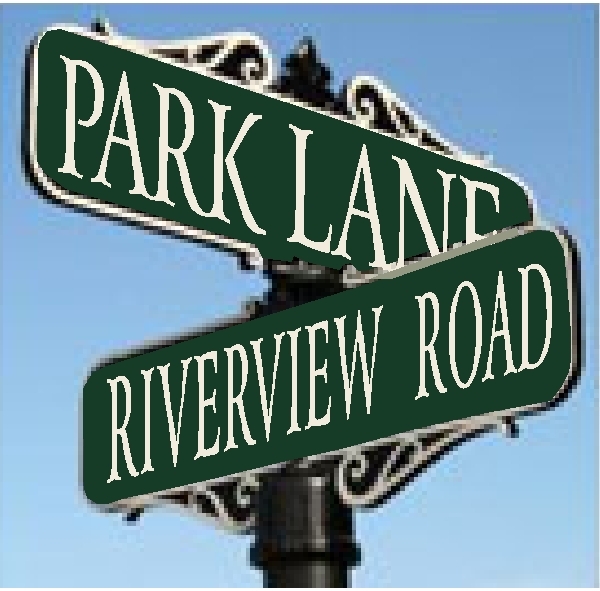 Our dimensional street name signs are carved from HDU, HDPE or wood. Our street and traffic signs can be mounted on our round aluminum posts in several ways, as shown here. This section of Gallery 17 shows custom signs and posts. Over 100 more steel and aluminum posts, bases, finials, scroll brackets and other mounting brackets are shown in Gallery 4, to see them please click on Gallery 4 - Sign Posts and Scroll Brackets.